I attended a good session at the ASAE conference about pricing. It was not a ton of new information, but it did provide a good reminder about the importance of value-based pricing. That is, consider what alternatives your customer has, and then compare the value they get from those alternatives with the value they get from your offering. That will help you set pricing. I like this approach specifically because it puts the customer at the center, not the organization. So often we (organizations) price based on our needs. Our costs go up, therefore we have to raise prices. But the speaker pointed out that we, as customers, don't shop that way. We don't even think about costs when we make the decision that $4.00 is too much (or not too much) for a pint of Ben and Jerry's. We just look at the Breyers on the next shelf over and decide if we can live without the chocolate covered pretzels, etc. We make a decision based on the value we receive (as defined by us) among the alternatives. They provide me, the customer with no value. 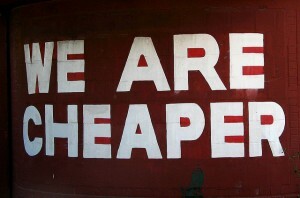 It is simply a pricing strategy. If I buy in bulk, I pay less per item. That's not value to me, that's just pricing. That pricing strategy might get me to buy, but it has nothing to do with the value I receive, so let's stop pretending that it does. What if you doubled your prices, and then doubled the discounts you're giving me. Would that double my value? No. Nothing would change, in fact. Get clear on the value part first (as defined by the customer, not you), and then talk about pricing and discounts.